Sols 2163-64, September 5, 2018, update by MSL scientist Lucy Thompson: In our case, the Curiosity rover! The main focus of our 2-sol (sol – martian day) plan today is to bump (drive ~15 m) the rover into place for an attempt at drilling an interesting grey coloured patch of bedrock, identified from orbit within the Jura member of the Murray formation on the Vera Rubin Ridge, referred to as “Loch Eriboll.” We want to figure out how these patches of bedrock differ from the surrounding tan coloured rocks, more typical of what we see from orbit. 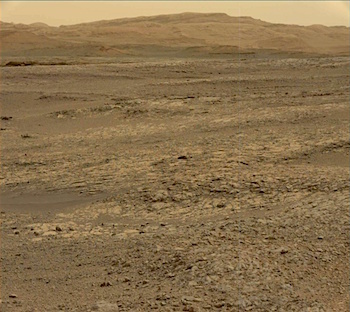 This entry was posted in Reports and tagged Aeolis Mons, Curiosity, Eathie, Gale Crater, Laithach, Loch Eriboll, Mars Science Laboratory, Mount Sharp, MSL, Murray Formation, NASA, Stoer, The Law, The Minch, Vera Rubin Ridge, Windy Hills. Bookmark the permalink.